Payment can be made by credit card (VISA or MasterCard) via our secure online eway payment system or using your Paypal account. What is Flat Rate Delivery? We charge a flat rate of either $11.95 or $15.95 (bulky goods) to ship orders of up to 1kg in cubic weight anywhere in Australia. A shipping surcharge maybe charged for regional or remote areas for orders over 1kg. If a shipping surcharge is applicable we will contact you. If after being advised of the shipping cost you wish to cancel your order we will refund your payment immediately. This excludes corporate and bulk orders which we will quote at time of ordering. For Australian orders, our delivery is subject to Australia Post delivery schedules. The Christmas Cart Shipping Notification email is your confirmation that your parcel has been dispatched from the Christmas Cart Christmas Workshop. It also contains your Australia Post Tracking Number. Should you require a faster delivery you can choose our Express Service delivery option. This service ensures that your order will moved to the head of the queue and we will ship select the quickest delivery service to your area. We use Australia Post and Fastway Courier for delivery of orders being posted within Australia and International Air Mail for overseas deliveries. Can I specify exactly when and where I want my package dropped off? Unfortunately, we cannot guarantee the couriers for either Australia Post or Fastway will deliver your items to a specific location on your property if you are not home to take delivery, nor can we tell them what time to make your delivery. You will have the option to ask them to “Leave if no-one is at home” and the driver will decide on the best location for your order to be left. You are welcome to have your order delivered to your workplace if you would prefer. How far in advance should I place my order for Christmas? Due to the high volume of orders we receive over the Christmas period we advise that you place your order as far in advance as possible. Feel free to contact us if you would more information. How do I place an order for more than 10 personalised baubles? Free easy ordering of large orders call us on 1300 72 47 10 or email info@thechristmascart.com.au and we will email you a spreadsheet to complete. What happens if I give the incorrect details for personalised items? It is your responsibility to ensure all text and order details are correct. Please check spelling carefully as we write exactly what you have provided. We do not take responsibility for your omissions or errors. Spelling and punctuation checks are your responsibility. If however you do notice an error, please contact us immediately, if the order has yet to be processed we will make any necessary changes. What glitter colour can I have? 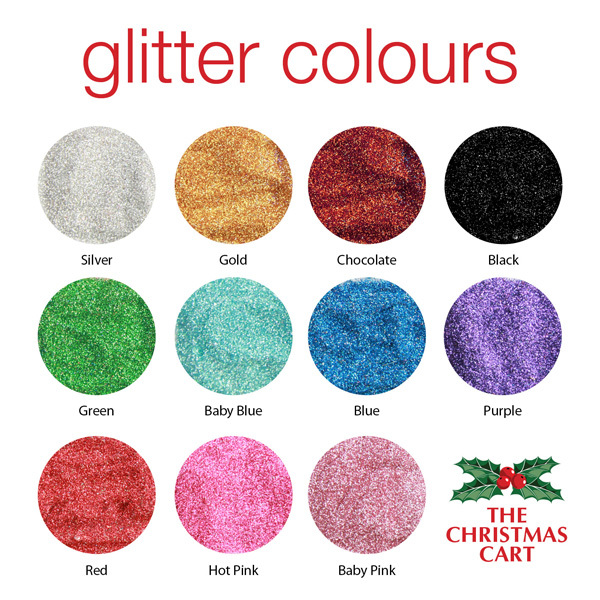 We have a range of glitter colours including silver, gold, red, purple, green, blue, baby pink, baby blue and hot pink, black and chocolate . Glitter colour will be at artist's discretion unless otherwise stipulated in the Special Instructions for each personalised product. How do you measure your baubles? The bauble size listed on the products refers to the diameter of the bauble. Goods that are ordered incorrectly will not be refunded. If you change your mind prior to the product order being completed & dispatched, or prior to any personalisation having been completed, please contact us, and if possible we will cancel your order. Cancellations will only be accepted by email to info@thechristmascart.com.au. Shipping charges are not refundable. What if my bauble arrives broken? We pack all our baubles and decorations with care and love but sometimes that is not enough. If any part of your order is damaged please take a photo and email it to info@thechristmascart.com.au with your order number and we will resend new items at no charge. You can contact us via email, phone or mail. Email: Complete and submit our enquiry form. Emails are checked 7 days per week and will be responded to within 24 hours.